Steve Blank Back to Colombia: Vive La Revolución Emprendedora! I think you are talking about Easy Dev. One of the selected teams by the Mintic In Colombia for funding. I am Colombian, living in Bulgaria from where I am offering to my friends and Colombian fellows the opportunity to access the EU markets (And others). I worked for more than 10 years with the Mintic Project from the private side of the fence, with the Compartel initiatives. I am close to some of the people working there. Nowadays there are 2 startup funds running in Bulgaria – Launchub.com and eleven.bg – which are taking the initiatives of the young companies and funding them with the usual startup process. I would be glad if we can have a talk about this, since initiatives similar to the Colombian one are happening in this emergent BG economy and it may be interesting for you, the startup companies and the Funds to have a touch of refinement in what they are doing. This is just a first thought about this, as mentor of one of those funds. I am using your book and Udacity lecture as guideline for the teams over here, recommending them to follow it. This is the thing: it is difficult for these teams to talk to others about their ideas, but if they don’t, how on earth they are going to know what they have to? there are a lot more to say, but I don’t want to keep you reading. Thanks for your time, and congratulations for such excellent compilation you have done in your book and in your lecture. To good to be true !!! Many people at many levels are still hesitant to understand the foundations of these deals with the Colombian government. Furthermore, only 2 out of 1,000 initiatives is a very poor ratio. Something smells bad, very bad. !!! 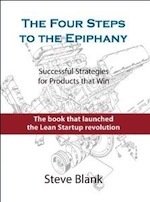 Thanks @bobdorf @sgblank for this great and successful method to create new IT businesses. We are changing the way entrepreneurs understand entrepreneurship and start up in Colombia! from the IT Ministry. Bloggers and entrepreneurship passionate people, I would like to invite you to visit http://www.apps.co the biggest IT entrepreneurs’ community in Colombia working with the customer development methodology. Thanks to Diego Molano Vega – ICT Minister of Colombia – to boost the ICT entrepreneurship ecosystem in Colombia! Thanks to the Customer Development Methodology and the support and mentorship from the IT Ministry of Colombia, SquadrApp will participate in the Demo Day in Bogotá by mid-february! Start ups rock! 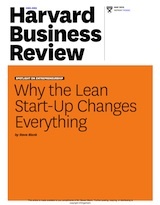 Sounds great, but better get the word right in spanish or stick w/”entrepreneurism” . . . The correct word is “emprendedorismo”, the entrepreneur being an “emprendedor”. . . Otherwise kind of sounds like getting pregnant . . ! Jjeje, the right form is “emprenderismo”. First of all congratulations for your initiative in Colombia. It’s great to see you’re expanding your methodology on spanish spoken countries. 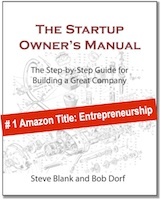 I’ve read in your post that some pieces of the Startup owner’s manual have been translated to spanish. I would be glad if I could got them. Do you know how should I talk to? Thank you for your trailblazing work. So are the Udacity.com videos and the Startup Owner’s Manual available in Spanish outside of this program? My organization, Green Worker Cooperatives (www.greenworker.coop), runs a 5-month boot camp for startup worker-owned businesses (aka worker cooperatives). Our program has been business plan oriented but we recently have chosen to switch to using the business model canvas and lean launchpad approaches. Our one problem is language access. We’re in NYC (specifically the South Bronx) and make it a point to provide interpretation and ensure that all materials are available in english and spanish. In a 2012 blog post on this site you mentioned that a spanish translation of the video was in the works. We’d love to get our hands on everything you’ve got in spanish. What do you have available? Also, given the size of the Colombian program,are they running a spanish version of Launchpad Central to manage communication between entrepreneurs and mentors? The folks at Launcpad Central say their platform isn’t available in spanish. If there’s a version available in Colombia, how can I get it?